Even though we're not able to reproduce this, I didn't want you guys to think that we're not listening or looking at this - we are. Now the truth of the matter is that relatively speaking there is only a very small percentage of customers who have reported this issue, and as I've said we're not able to reproduce this. But starting next week I'll have 7 guys with 7 different systems looking at this. I have a working theroy that at least part of this is due to how the FMGS is being programmed and that is SOME cases weather is playing a role, and in at least one other case it was due to stuttering (that one has been resolved). Even if all of these factors are considered, there are still more things to look at. So again, I just didn't want you guys to thing that we're listening with deaf ears. Unless we stumble on something, our testing will last for 7 days (lots of things to look at and different routes to fly). So please be patient. One thing... if you've had this problem and haven't provided your complete route and flight level... please do so and we'll have the guys fly your route. Thanks for your continued patients. I'm gonna Check all parameters regarding restrictions very carefully this evening. But as it happens every Single flight, no matter what the destination is, I assume, that might not be the key. I do know, that the flight was very short, I did it to check the CI 50 setting quickly. But I promise you, it also happens on 2 or 3 hour flights. And don't worry, I Personally never had the feeling, nobody at aerosoft would listen. I rather find it wonderful, how caring you guys Are. Thanks for that! The other way round, I definitely do not want to be that annoying customer, who points at that Problem, yelling "fix that first". I simply want to help you as much as I can, to make that wonderful plane even better :). Thanks! Do believe me that we monitor this issue. What I have seen myself is that there are weather engines that could play a factor by sending in rather severe wind changes to get a more detailed weather pattern (we are NOT fans of that). 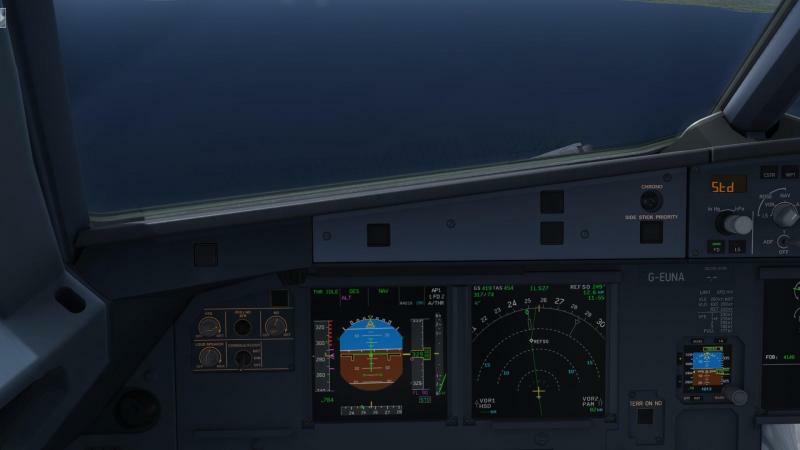 Als the aircraft (certainly the 319) is rather picky on speed management in the initial stages of descend. There is a lot of information about this on the web but what is clear is that you should not try to slow down and start a descend at the same time. You will be behind the curve the whole time. Also keep in mind that descend profiles are not set in concrete, nothing wrong with some spoilers when you need it. Just make sure you assign an axle to thed spoilers so you can give a little bit and do not have to set it binairy. 2) The same route EPGD (rwy11) - EGLC (rwy27) with clear sky weather (without Active sky 2016). Initial descent rate at the T/D are aggressively in all flights and it was around 5500-6000 fpm for first flight (strong wind on initial descend)(screen 1) and 4000 - 5000 fpm for second and third. In the remaining of the descent path in flight 1 and 2 descent rate was good and it was about 2500 fpm. The exception was the third test flight where the descent was around 4900 fpm (screen 2) and more at waypoint NEGUV at FL210. T/D was 72nm before runway 09 (it seems to me, that point T/D has been to close to the airport) and initial descent rate was 7000 fpm (i think it's to much). The wind was stable. I finished just now another flight and prepared all data. I managed descend ~ 10 nm before TOD, the plane started descend at rate ~ -6000 fpm. Using speed brakes increased a rate much more. The weather was clear and flight was smooth. I used CI 50 for this flight as was suggested before. Aerosoft team please help. I am despaired. Guys, please pay attention that the problem with the vertical aggressive speed in Managed mode is happening not only on descend but during climb as well. It happens every single flight with me. And I made so many flights already to/from different locations around the world. The rest is working smooth. Question for you guys: Does anyone here have issues with the descend rate of the Bus? Im getting crazy descend rates up to 6000 FT/M. Does this happen to anyone else in here? I have this issue : when approching aircraft starts ascending like crazy at high rate. Last thing happened was after descend initiated descending was at very low rate so I changed vertical speed to 4000fps and no change to descending whatsoever. On Saturday I could see this issue for the first time myself on a customers system. IIt was indeed strange and unexplainable. As this was a system that was updated with the client only we deleted the sim and all it's temp folders and installed the sim and aircraft again. In the short try we could do (running out of time) we could no longer recreate the issue. The fact this seems to affect our bus and not other aircraft seems to be because we compiled with the June 2018 Lockheed compilers (that's the ones that make things so much faster). I have completely new hdd on my pc with clean win10 and full latest installation of P3D V4, and still have same problem (look at my post above) so the version of the P3D seems to not have nothing to do in my situation. Maybe not the P3D version, but the way it was installed or some other addons that affect or tweak the sim. That's why it could be related to a customers system, even though it was a clean install of the latest P3D version. Same here. Latest "fresh" p3d version is installed (not just an update). Do you know which add-on/s may cause this? Cause we can easily check it by removing that add-on. Unfortunately not (yet), the only thing we know at this point is that for the one customer where Mathijs saw the issue only a total clean P3D installation solved the issue, including deleting all he leftover folders after the P3D uninstallation. Okay so we have two users who reported this condition. Would you be so kind to fly the step-by-step flight and see if you see the same there? As thousands of customers must have flown that it's the best flight to work on. One of our Beta Testers and I flew the same route yesterday in the A319, I suffered a CTD (StackHash, which one might see once a year even if they don't have any issues...just a burp). The other tester experienced 5000ft per minute descent rate. He's in the process of writing up all the data on it. Along with what Mathijs said, looks like we've been able to replicate it twice now. But that is twice on several tens of thousands of customers now. Even though I had a CTD, I did fly half of the descent and it was picture perfect. 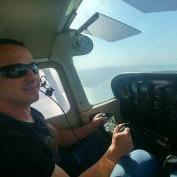 I asked Grant to fly without updating or manually entering any wind data, and I have to double check that he did that. If so, then the wind data might be the culprit. Mathijs excuse me but this is not serious comment. I think there are more than 2 people having issues, even more than 4. I don't know about hundrets ot thousands you are talking about. Maybe they dont have any issue but I do. I sent any info you requested and asked for help. The answer that thousands other customers dont have any issue dont help me or other people to solve this issue and for me it is critical. We ARE looking at this, and we ARE taking it seriously. We just tasked 7 guys with 7 different systems to devote a solid week (part time) to looking into this. That is CONSIDERABLE resources and it pulls them off other important things they could be working on. The number is 8 counting me, though I'm working on several different things at once. What Mathijs is trying to say is that this is difficult one to pin down because the vast majority of our customers don't have this issue. Mathijs has to address many issues spanning the width and breadth of this (and other) projects and like any one in that position some responses are not as detailed as they might be if one wasn't so overwhelmed. We appreciate your patience my friend. We're really are taking a hard look a this. I am very appreciate it! 1. I reinstalled airbus completely (including deleting all folders). 2. I did another flight without updating wind data. Same route as last flight. Unfortunately same happened and the plane reached -5000ft/m during descend. The fact thousands of people do NOT have this issue as far as we know is a pretty serious answer. It seems hard to refute that, right? I am pretty sure there there are more people who have this issue and when they report them we'll seriously look at them. But we can only work with the information we have. If you feel the issue is with the code I ask y9ou the simple question, who do other people do NOT have this issue? We are really sorry you got the issue but we got to keep logic in mind. If there are thousand of people NOT having a problem and handfull have I think we are in pretty save territory saying the files are fine. The only other logical solution would be that all the other thousands of users got some weird sim install that just matched what we worked for. No be honest, that does not sound logical. With every single release we ever did we had exactly these problems, for a certain number of customers things do not work. In the past I invited them to come by them and have full unlimited access to their system and solve the issue. If it was solved they would pay all cost, if it was not I would pay. One time a Greek gentleman (a friend now) took me up on that offer. I wiped his disk, installed Win10, P3d V3 (it was not recent), the Airbus A320 and shown him it worked exactly as I said it would. See, in the end it is all about numbers. We sold many thousands of copies, we gotten a lot or fine feedback. I understand and accept you have an issue, but again, if you blame the code, explain why thousands do NOT have the issue. Your comments are pretty visible here, but as proof that the code is fine let me give you a sample (!) of the feedback we had. Are all these customers wrong? Great bus and a fantastic support team. Respect! In view of the many thousands hours of work and the huge invest for development, the pricing is extremely fair for such a complex aircraft. Especially for those customers that own one of the previous busses, it should be a no-brainer. thank you for the a318/319! this a/c is a great job of programming. Love it. congrats on your job, excellent addon. Move over FSlabs, there is a better bus. This was worth waiting for!? Clap yourself on your shoulder! You have every reason to be proud! Fantastic add on to the Airbus collection"
congratulation to an awesome job!!! The best way to show FSL how it should be done is to make something better. Aerosoft just did. This is definetely a new and wonderful product. I love it! Its working great in VR! I'm very happy with the Buses. SO IM VERY HAPPY CONGRATS! What's the most spectacular thing about it, is the modelling. Dude, thats impressive. Ecspecialy the Virtual Cockpit looks incredible. I bought the FSL as well. What the hell is wrong with me? 150 EUR gone, never gonna use that one again. The Professional Bus impresses me a lot. It feels smooth, it runs incredibly smooth (at least for what I'm used to from the PMDGs and the 787). It sounds great, can't wait to try the shared cockpit Feature. congrats on an unbelievable aircraft! 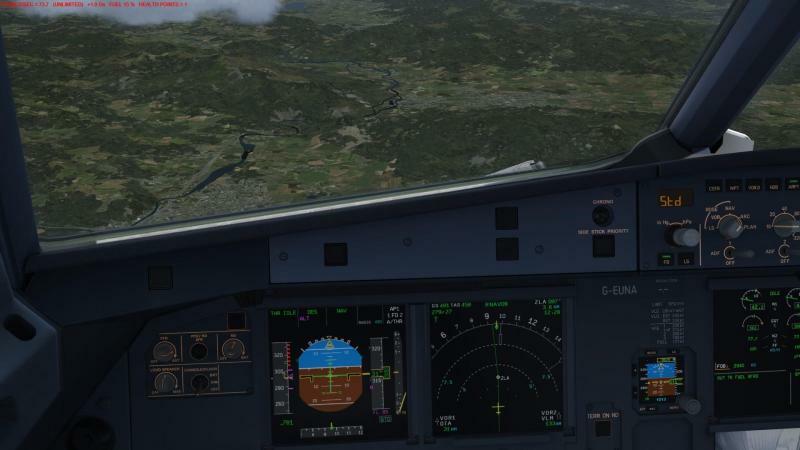 kEEP up the good job Aerosoft!! Factastic product, fantastic price, no DRM. Aerosoft I love you. And the discount is beautiful, 4 Airbus models for 41 euros, in my case. This is heaven. It is absolutely fantastic?. So easy to install. FPS are great even when I loaded up in JFK. Impressive work, as always from Aerosoft! Looks good, sounds good, flies good. Very happy with the frame rate. Did three test flights in three different models and all went perfect. Thanks goes to the development team. Well done...well done indeed. Thanks again for a fantastic aircraft! And the documentation is as always very good and easy to read. Brilliantly sorted out by the excellent AS support team. Great job on the product though! you guys are awesome... congrats to the team... love the plane. Great work on the airbus lads! By the way, you really did a fantastic job on the VC, that looks great now! long way better than FSL of course, and even better than NGX. Incredibly very smooth on frames! the performance to eye candy ratio in the sim is something to be proud of...never dips below 4?5fp??s?? Thanks for this piece of work, great job. Best framerate optimizing I have seen for any add-on in 64 bits. Why don't all devs provide newly compiled models? Double the frames compared to the FSlightsimlab airvus, super! So smooth and fast, other teams should ask you how it's done. this Airbus has been done so beautifully well in performance, features, animations, textures, systems, and extras, that it is almost impossible to dislike or say it's not my taste. Have to say this is the most impressive 'first impression' I have had from any of the buses.Bravo! Wonderful job with this aircraft, definitely hits the price point perfectly, dare I say even a bargain for what one gets! Framerates and performance are very good on my system, the level of detail and systems complexity is exactly what I am looking for. I can also say that of all the other Airbuses, this one is working without any major flaws in VR which I felt I should congratulate you all on. You all did a great job thus far with the aircraft and i look forward to the 320 and 321Firstly, really, really impressed with the new bus. Absolutely worth the wait, well done! Congrats, and keep them coming! the built in First Officer and checklist were just amazing to me, and added so much depth to the flying experience. Well Done on this project. It's a great package, by the way. the A319 is already stunning and I just love the handling of it. Great job Aerosoft! Looks great and performance is fantastic. Thanks for the great product! I really enjoy the light effects and the MCDU on the iPad. Big fun! Thank you, and congratulations for such a great work with this aircraft! Superb software by the way. Love your aircraft, she flies very well! 1. I didn't say even one time that the problem is with the code. Did I? I just said that I have an issue. A few other people commented the same. 2. One of the feedback's of people that like the product is mine. 3. I don't want to argue with you as I have much respect to you and whole Aerosoft team. I just asked for help. Sorry it doesn't getting along your statistics. 4. I waited for this product for a long time and supported this development in many Facebook groups. So I am not looking for problems, throlling and etc. I am 39 years old and have enough things to do in my life. 5. The bottom line, sorry for bothering you. I don't know what to do and I leave it here. 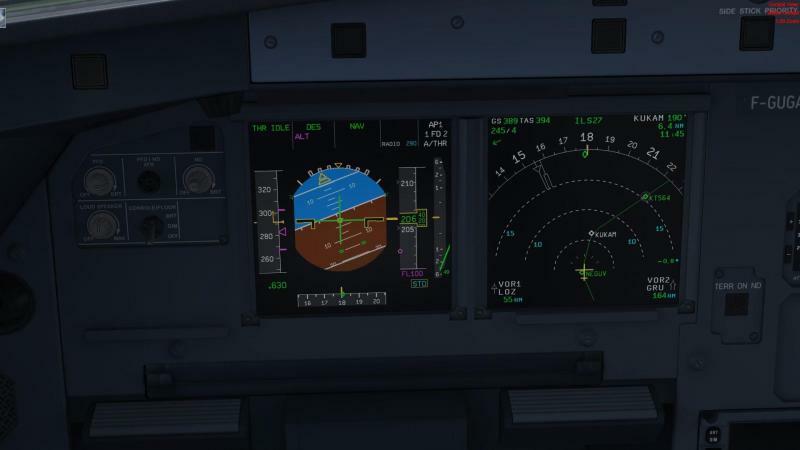 I managed descend 10 nm before TOD and the plane start descending with rate around 5700 fpm. After that to FL150 aircraft descending with around 4000 fpm , then he accelerated to 6000 fpm. Last turn before final approach aircraft again start descending with 4000 fpm.